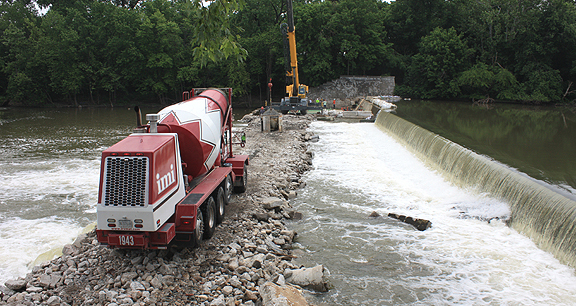 Project obstacles and solutions: Citizens Energy Group was replacing a dam on the White River in the Broad Ripple district of Indianapolis. The original dam was constructed with timbers in five sections between 1922-1924. Thieneman Construction was awarded the contract for the reconstruction of the dam. They poured a new concrete apron in three phases. Safety on a job like this is of utmost concern. The depth of the river on the back side of the dam reaches 15-20 feet. That and the force of the water going over the dam would engulf any equipment falling into the river. Thieneman built a rip rap bridge over top of concrete pipe that channeled water downstream. Water levels were monitored to make sure it was safe for equipment and personnel to traverse the bridge to the work site. Concrete was bucketed by crane to the pour site from the bridge. With the rising and falling of water levels, keeping concrete in ready supply became tricky. At times, that was a minute by minute proposition. IMI dispatchers stayed in contact with drivers and personnel at the site to keep mixer trucks properly spaced when crews were cleared to pour. When water levels rose, trucks were rescheduled. IMI delivered nearly 1,200 yards of concrete for this project, which represented 150 mixer trucks dispatched to the site over the course of three months.